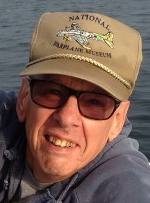 Ronald C. Basen, 79, of Conneaut, passed away Thursday August 23, 2018. He was born July 27, 1939 in Lakewood, OH, and was the son of Robert and Francis (Stewart) Basen. Ronald was a United States Army veteran and retired from Red Dog in Erie, PA, as a tool and die maker. He enjoyed flying model airplanes, motorcycles, and camping with family. His most treasured times were spent with his grandchildren. He is survived by his wife Alice (Vanderwerf) Basen, whom he married June 11, 1960; his children Sherry (Walter) Cooper, and Michael Basen, both of Brecksville; his siblings Nancy May of Whitehouse, Helen (Robert) Mackey of Conneaut, James (Arlene) Basen of Saybrook, and Robert (Josie) Basen of Rocky River; his grandchildren Sarah (Tom) McFarland of Olmstead Township, Ryan Cooper, Noah Cooper, and Nina Cooper all of Brecksville; and great-grandchildren Luke and Jack McFarland. He was preceded in death by his parents and his sister Mary Kaim. Memorial service will be 2:00PM, Sunday, August 26, 2018 at the Marcy Funeral Home, 208 Liberty St., Conneaut. No calling hours will be observed. Contributions may be made in memory of Ronald to First Assembly of God. Envelopes will be available at the funeral home. Sign the guestbook at www.marcyfuneralhome.com.